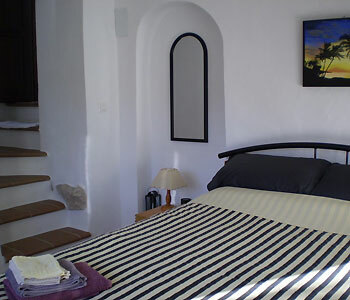 Casa El Corchito is located in an old roman street in the historic part of the village known as 'La Raspa'. Our in 2010 renovated casa is down the steep alley: Calle Cardenal Herrera Oria at nr. 22 in Montejaque. The small street is not suitable for cars, so parking is in the main street of the village. Both guestrooms ensuite have views over the rocky garden with the relax pool and several terraces to the surrounding mountains. • rooms & bathrooms have heating. • and books, t.v. and radio. 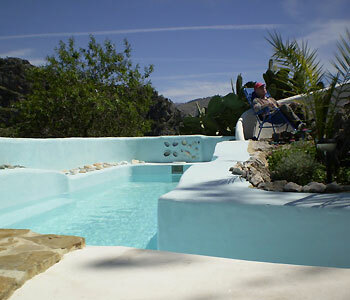 • relax pool /barbecue area. • cycle hire and safe cycle storage. • pick-up from train/bus station in Ronda or Benaojan on request. After your lovely enjoyable day, why not unwind in the relax pool or treat yourself to a BBQ on request. We can arrange a pick up/drop off from/to train and bus station in Ronda or in Benaoján.